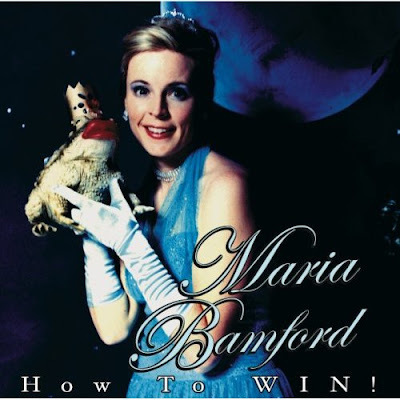 Maria Bamford, whose 2009 Christmas Special I continue to recommend, has put out three solo albums of her comedy and occasional singing that I'm aware of, and of these perhaps the second, so far, How to Win, is the best introduction to her work for those who haven't seen or heard her before...certainly, the longform Comedians of Comedy concert dvd (as distinct from the multi-episode series on Comedy Central) isn't recommended by me for her, because as one of the hosts, so to speak, she rushes a truncated set so as to give enough time for the other comedians to get a shot on stage (and on camera)...David Cross and H. John Benjamin's self-indulgent and misfired duo bit is allowed to go on forever, however. More self-assured than in her first concert album (The Burning Bridges Tour) and less self-revealing than in the later, slightly darker Unwanted Thoughts Syndrome (both of which are also urgently recommended...the last also comes with a dvd of her web series, dramatizing her life if she'd had a complete breakdown and fled back to her parents' house to recover), How to Win is also her most outspokenly feminist of the three concerts, and catches her at her most energetic and accessible. Sweet Freedom was originally a radio show, first on WGMU-AM in Fairfax, VA (the George Mason University station), then on WCXS-FM (now WEBR) in Fairfax, where it was co-conducted for several years by my SO Donna (and our show was followed for a couple of years by my brother's), then on WPPR-FM (aka Radio Mutiny) in Philadelphia. It was always devoted to the raucous...free jazz, punk rock, electronic music, folk music, spoken word ranging from Noam Chomsky to Harlan Ellison to in-studio interviews with people such as Bob Black, Ted White (for contrast) and Douglas Winter (more gray scales), who wrote an inscription on a book of his to me that scared the hell out of my father. But also a lot of third stream music, which could be pensive and anti-raucous. So, I thought I'd put up some links, for festivity's sake. Or perhaps I'm simply nostalgic. The most famous Brubeck Quartet, of alto saxophonist Paul Desmond, bassist Gene Wright, percussionist Joe Morello and pianist Dave Brubeck were my first favorite band...the Miro Reflections album my first favorite suite. This quartet's last album in their first run, Time In, featured this fine excerpt from Brubeck work in progress The Light in the Forest, referring to the forty days of Jesus of Nazareth's fasting. Brubeck plays somewhat freely here, Desmond as usual also not repeating himself. From a concert for German television. The MJQ: "Swing Low, Sweet Chariot"
Donna and I were at the Warehouse: Songs and Stories tour stop in DC. The audience wasn't allowed to dance or even stand, and the Huskers weren't in a very good mood...they simply turned up the volume after every song, and said nothing that wasn't a lyric. Writer and editor Janet Fox, 68, died [October] 21, 2009 at home in Osage City KS after a long struggle with cancer. Fox began publishing short fiction in the 1970s, and published scores of stories and poems in magazines including TWILIGHT ZONE, WEIRD TALES, CEMETERY DANCE, and others, as well as numerous anthologies. Under house name Alex McDonough she wrote five books in the Scorpio novel series for Ace, from 1990-93. She edited monthly market 'zine SCAVENGER'S NEWSLETTER from 1984-2003, and was secretary/treasurer of the Small Press Writers and Artists Organization. A.R. Morlan has been named Fox's literary executor, and can be contacted c/o Locus. See the January issue of LOCUS for a complete obituary. --She was an underappreciated writer, who in horror notably did a series of stories over a period of years that concretized bromides such as "You can't take it with you" ("Materialist," MAGAZINE OF HORROR, May 1970, apparently her first sale) and "Inside of every fat person..." ("Screaming to Get Out" WEIRDBOOK 12, 1977, and collected in Gerald Page's THE YEAR'S BEST HORROR STORIES VI ), among much else in the horror field, and at least one excellent series of S&S stories, the Arcana sequence, such as "Demon & Demoiselle" (FANTASTIC, October 1978). She bought a poem from me for SCAVENGER'S NEWSLETTER, published in 1989, my first arguably pro sale in fantastic publishing, and despite that desecration SCAV was a fine 'zine. It's been a bad year for my friends and a bad year for my editors. I didn't know she was ill, and am sorry she's gone. LOCUS has typoed the month of her death...October, not September. Her funeral was on Hallowe'en, which might've pleased her (if one has to have one, as one more or less does so far...). OSAGE CITY Janet Kaye Fox, 68, passed away Wednesday, October 21, 2009, at her home in Osage City. Janet was born October 25, 1940, in Topeka, the daughter of Earl and Luella Dorothy Nordling Fox. She graduated from Osage City High School in 1958 and Emporia State University in 1965. She taught school two years in White City and 15 years at Osage City High School and a number of years after as an instructor for Writers' Digest School. After retiring from teaching she was a writer and had worked as a bookkeeper at Nordling Motors in Osage City. Janet had served as secretary/treasurer of the Small Press Writers and Artists Organization, as well as issuing a newsletter for the group, afterwards establishing Scavengers Newsletter, a monthly market letter for SF/Fantasy/Horror/Mystery writers and artists with an interest in small press published from 1984 to 2003. Her writing career has extended from 1970 through the present, with her work appearing in professional and small press publications. Most of Fox's book length fiction has been written as Alex McDonough, the shared pseudonym under which Ace Books' six-volume Scorpio series was issued in the early 1990s. She wrote all but the first volume. She has also written, under her own name, the [short fiction collection] A Witch's Dozen (2005) and numerous short stories and poems. Janet was a member of the Osage City United Methodist Church. Survivors include a step brother, John Soetebier, Americus; an aunt, Evelyn Slater; cousins, Judy Alexander, Melvin Slater, Phyllis Slater, Rosie Slater and Victoria Rubottom, all of Topeka, Stephen Rubottom of Kent, Washington, Paul James Rubottom of Emporia, Joseph and Carolyn Nordling of Admire and Thomas and Helen Nordling of Osage City; and dedicated friends and caregivers, Sharon Larson and Charles and Deborah Cook, all of Osage City. She was preceded in death by her mother and step father, Luella and August F. Soetebier and her maternal grandparents, Joseph E. and Hannah Matilda Nordling. Memorial services will be at 10:00 a.m., October 31, 2009 at the United Methodist Church in Osage City. Memorial contributions can be made to the United Methodist Church or the CAT Association and sent in care of VanArsdale Funeral Chapel, 107 N 6, Osage City, KS 66523. My Brother Stevie by Eleanor Clymer (Holt, Rinehart and Winston 1967) was my first favorite novel; I read it when I was about seven, and it involves a girl permanently abandoned by her parents with the instruction to take care of her junior hellion brother...as a kid with a new brother and some very busy parents still fairly recently moved to my third state in three years, this narrative not too inexplicably spoke to me. It was grittier than nearly anything else I read at that age, and seemed to have a good sense of how bewildering everything can be to a kid at that stage of life (you might think things are beyond your control now, and you're correct in too many ways, but cast your mind back to your single-digit years and not long after). A helpful teacher helps put things (mostly) aright. 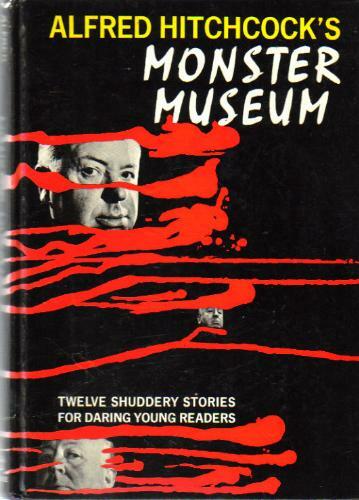 Alfred Hitchcock's Monster Museum was just one of the several anthologies aimed at young readers specifically that Robert Arthur ghost-edited for Hitchcock to put his name to, as Arthur was also ghost-editing Alfred Hitchcock Presents: anthologies aimed at the adult market at the same time; I read both series together and loved their eclecticism, as I've mentioned multiple times on this blog and elsewhere, as well as their reliability (Arthur was an excellent editor as well as a good writer, and his successors, after his death, often did a reasonable job of keeping up with him--Arthur also edited, in the clear, such YA anthos as Thrillers and More Thrillers and, earlier, had been the editor of The Mysterious Traveler Magazine, branded for his radio series and one of the great "lost" shortlived fiction magazines). The original hardcover editions were interestingly illustrated, and the paperback editions were, for no compelling reason, sometimes abridged. Edited by Robert Arthur. "Twelve Shuddery Stories for Daring Young Readers." Illustrated by Earl E. Mayan. Random House New York. @ 1965. 207 pages. --note the Sturgeon is missing from the British paperback, and probably from the US pb as well. I have to wonder what British editorial hand forced the title change on the deFord (or was it H.L. Gold's notoriously heavy hand in the original magazine appearance, finally fixed up in the UK reprint?). For more, mostly younger-readers' (this week) "forgotten" books, please see Patti Abbott's blog. Slightly more stream-of-consciousness than her standup act, so that Oprah Winfrey is referred to, early on, as "Opes." Dunno if she's saying goodbye to some of this material, much as Jerry Seinfeld used to. But I like her work a lot. Maria Bamford's Christmas Special! from Punchline Magazine on Vimeo. Very happy to see and hear this. The newly rereleased album's cover on DeSoto, and the original Atlantic cover. Okay, so, more than any other single book, except perhaps the Ellison collection/anthology Partners in Wonder, this one's responsible for my typing this bit of electronically-captured prose...for it was a rather delayed but nonetheless welcome celebration and representation of the First World Fantasy Convention, in Providence, RI, in 1975 (venue chosen in honor of H.P. Lovecraft, in whose likeness the annual award statues, the Howards, are struck, from a design by editor and world-famous cartoonist Wilson. I was aware, distantly, of the fannish subculture that had developed around sf and fantasy, and had spread to help create similar subcultures around crime fiction and comics (and was helping to create one around punk rock as this book was being published, even as it had particularly around folk music in the '60s), but this book is also an invitation to the ongoing World Fantasy Conventions and all their sibling gatherings, publication, etc. 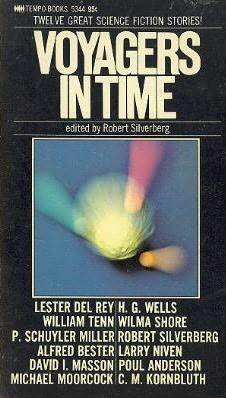 Isaac Asimov's introductions to The Hugo Winners volumes and the SFWA Nebula Award anthologies also had a similar effect, but they documented the fannish apparatus rather more sketchily than the speech transcripts, the bits of on-the-scene journalism and other matter usually not published in a trade-press (as opposed to fannish-press) book, left out at libraries where not-particularly-innocent children can stumble right across them (I was already a fan of first Life Achievement Award-winner Robert Bloch, whose stories collected here were more rare [at that time] than good, and of Manly Wade Wellman (his sample stories are better and more representative), and certainly knew of J.P. Brennan's and Robert Aickman's work...but I believe this might've been my first exposure to Dennis Etchison, Fritz Leiber, and certainly to T.E.D. Klein and Patricia McKillip, her excerpt being the major representative of non-horror fantasy in these proceedings (though David Drake, whose work I believe I'd seen in The Year's Best Horror Stories annual, skirts the line there, too). Never did develope a taste for Sterling Lanier's club stories in the Brigadier Ffellowes series, in the tradition of Gerald Kersh and Lord Dunsany, among others (who did it better)...Lanier might be remembered longest for being the editor at the Philly-suburb how-to publisher Chilton who encouraged them to take on a much-rejected epic sf novel by newish writer Frank Herbert, Dune, which gave him some leeway to publish some further fiction titles there, including his own work. And Lee Brown Coye...just the other day, the town of Hamilton, NY, saw an auction to fundraise to preserve a mural Coye did there...all in all, a fine anthology, but a more important document (that Stuart Schiff's Whispers magazine started publishing best-of/new fiction anthologies the next year didn't hurt, either). 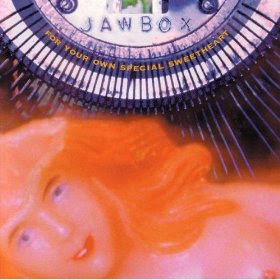 Meanwhile, a "forgotten" album is about to be re-released...Jawbox was the best of the punk/postpunk bands to form in DC in the late '80s (better than Fugazi, certainly, and better than such wonderful live acts that recorded poorly as Fidelity Jones or Autoclave...), and they did one superb (incorporating their wonderful ep and another anthology track) and one good album on Dischord Records, the legendary DC-based indie label, and went on to sign with Atlantic Records in 1993, the first of the DC punk bands to follow in the wake of Husker Du to take that gamble (it paid off about as poorly for them as for the Minneapolis band...though, having interviewed Jawbox with my then not yet Ex Donna some months back and having been one of their most voluble fans in the various media available to me at the time ["alternative" newspaper, fanzine, radio--the show Sweet Freedom, actually], I ran into J. Robbins at someone else's concert just after they'd signed the contract and just after I'd sold my first short story, and we wondered just how much of the world was breathlessly awaiting our next steps). 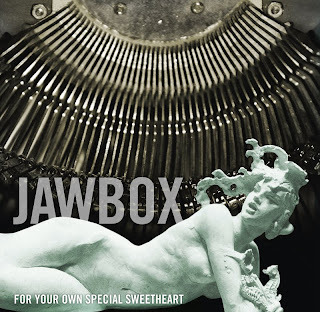 Since then, Jawbox has broken up (it's been a dozen years now) and while their members, particularly Kim Coletta, have made a real label out of DeSoto Records (formerly an injoke that various DC sorts would slap on their self-released items), having released among much else an excellent odds and ends collection My Scrapbook of Fatal Accidents and now a remastered version of the first, brilliant Atlantic album, For Your Own Special Sweetheart, which I thought sounded pretty damned good the first time around...to promote this rerelease, the band will be reforming to play on NBC's chat show Late Night with Jimmy Fallon on December 8th. Perhaps a tour will follow, which would be nice. Here's a sample of FYOSS, including the song "Motorist" inspired by J.G. Ballard's novel Crash, recorded well before the David Cronenberg-directed film adaptation.